Pristine Mid-Century Masterpiece - Showings begin for 10243 Julius Northway on May 27 at our "Twilight" Open House from 4:00 PM to 7:00 PM. • 1,996 sq. ft., 3 bath, 4 bdrm single story - $269,900 - Mid Century Modern Gem! 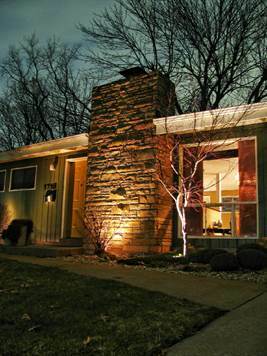 Sunset Hills, St. Louis County - Swanky mid-century modern paradise that is truly perfection! The seller is only the second owner (and both clearly knew and loved what made this home so special) which is why it maintains so many of it's unique original features. You'll feel like you've been transported back to the 1960's with a "twist" of modern updates that stay true to the origins of the home without sacrificing features. Even the furnishings have been hand selected and procured to match the period (the furnishings alone make it worth seeing this one in person). This light filled masterpieces includes vaulted exposed beam ceilings throughout the main livings spaces, built-in indirect fluorescent lighting, floor to ceiling windows, atomic style original lighting, tiled period baths, original steel cased windows, and an original GE kitchen! The kitchen includes a truly rare and fully operational three section GE Wall Mounted refrigerator/freezer designed by George Nelson of Herman Miller for the "Wonder Kitchen" in 1955. The matching GE metal cabinets are highlighted by red laminate countertops with stainless steel edging, a built-in wood cutting board, and an original cooktop with an in the wall control panel and exhaust fan. The open living room flows beautifully into the family and dining rooms which share a two sided fireplace and original exposed beam vaulted ceilings. There's also a hidden office closet, a mudroom with lockers, and a split bedroom layout consisting of three bedrooms and two original baths on one side of the u-shaped home. The opposite "u" features and incredible master suite that blends so perfectly with the rest of the home that you would NEVER guess that it is a recent addition. Every detail was planned to perfection so that it would match the existing home. It includes a floating king bed frame, built-in shelving, double doors leading to a huge private deck (center of the u), large custom floor to ceiling double pane UV windows with safety glass, separate heating/cooling heat pump unit with it's own remote control, and vaulted ceiling with original exposed beams repurposed from other areas of the home. The spa-like master bath is truly gorgeous with it's Sputnik chandelier, luxurious custom tiling, oversized wall mounted sink with dual faucets, a freestanding tub and an incredible oversized walk-in shower with rain shower head. If that's not enough the lower level is a playhouse paradise with tons of additional living space and a second fireplace. Outside is the incredible private deck with multiple sets of doors opening from the master and main living areas. You'll love relaxing here after you pluck the day's produce from one of several raised garden beds. This is truly a gardener's delight with multiple fruit trees (apple, cherry, apricot, pear, peach and plum), 15 grape vines and a multitude of mixed berry bushes that will provide fresh fruits and vegetables throughout the season! There's also a large three section built-in compost bin, side deck and children's playhouse. Visit our open house at 2920 Middlebush on November 10 from 2:00 PM to 4:00 PM. Affton Heights, Affton - We invite everyone to visit our open house at 5225 3rd Ave. on September 8 from 2:00 PM to 4:00 PM. OPEN THIS SUNDAY - 1611 Greening Lane in Kirkwood on July 14 from 2:00 PM to 4:00 PM. Fabulous Ridgewood Mid-Century Modern - Don't miss our open house at 1718 Liggett on April 2 from 11:00 AM to 1:00 PM. Kirkwood, St. Louis County - Picturesque cottage charm leaves you feeling like you're vacationing in Nantucket! You'll fall in love with this darling home with it's beautiful picket fenced backyard, curved patio and wonderful screened porch. There's also a two garage garage which is almost unheard of in this price range. The interior is fresh and airy with modern retro touches throughout including a 50's style cheery yellow kitchen with an incredible original porcelain sink with double drainboards and original metal cabinets. The newly updated bathroom features wainscoting and clean, fresh, white tiled walls and a recently discovered (and now exposed) glass block window. The master is large and inviting and the second bedroom was transformed into darling children's room with custom wall paintings. Downstairs is an incredible pub/media room which is wonderful for entertaining as it has immediate access to the screened porch for extended outdoor parties. The backyard is a gardeners delight with wonderful specialty trees, a garden and beautiful perennials. There is also a lovely curved patio that winds past the screened porch. 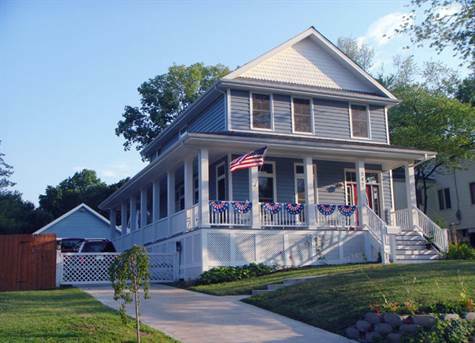 Enjoy walking to downtown and Kirkwood park and have front row seats for the 4th of July fireworks which light the sky directly over this home. From here you can also walk to the charming Keysor Elementary which is undergoing major renovations this summer, and you're also just a few blocks from Kirkwood high school. You'll simply fall in love with this wonderful neighborhood, location and truly charming home! 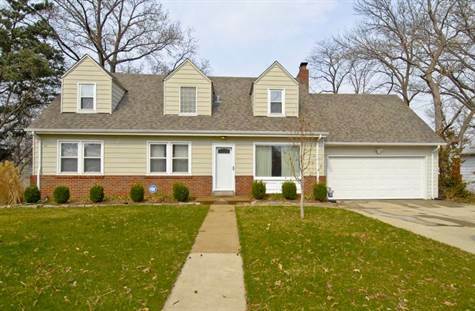 Kirkwood, St. Louis County - Everything you've been waiting for and more. This beautifully updated home has 4 bedrooms, 2 full baths and a large TWO car attached garage. You'll love the modern, fresh decor including a newer kitchen with maple cabinetry, and all new appliances. It is completely open to the breakfast and family room with a gas fireplace that is truly the heart of the home. Just off the kitchen is a large dining room that is both elegant and casual at the same time. Step out back to a fabulous fully fenced yard and newer cedar deck. The home is in the Osage Hills (Greenbriar) neighborhood known for their annual social events and activitites. 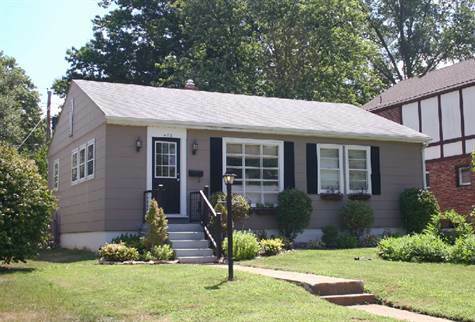 Two bedrooms and an updated full bath complete the main level. Upstairs is a landing/sitting room and two large cottage style bedrooms with multiple closets and a 2nd fully updated bath. The lower level is open, clean and bright and could easily be finished as a rec room in a snap! It also walks out to the back yard. Be sure to open the link to the list of upgrades and property brochure (left column)! Please note...photos shown are before sellers moved out. Currently occupied by tenant through June 10th, 2012. Kirkwood, St. Louis County - What a truly amazing 4 yr old home situated on an extra deep 200 foot lot with over 4000 sq.ft of luxury living space just two blocks from the heart of downtown Kirkwood (a location that is beyond compare). It's truly rare to discover this level of period detailing and historic millwork in a newer home. It rivals the "grand dame" homes that put Kirkwood on the map as one of St. Louis' most desirable communities yet it has all the amenities and modern features discriminating buyers crave. Here you get the best of both worlds! Let's start with the craftsmanship including solid oak panel doors, magnificent inlaid wood flooring and gorgeous oak throughout both levels of the home including all bedrooms. You'll fall in love with the natural wood moldings, traditional wainscotting and box beam ceilings as you enter the home. The period style kitchen includes gorgeous soapstone counters, custom hand made cabinetry, a traditional "milk-paint" stained island and backsplash, period lighting/hardware, a deep farmhouse sink and modern stainless appliances. The kitchen opens to the large great room with it's solid oak bookshelves flanking a custom-built fireplace mantel. The breakfast room opens to a charming covered porch and access to the beautifully landscaped backyard (with sprinkler system) and what is likely one of the oldest grand oak trees in all of Kirkwood. The carriage house garage includes an upper level workroom/storage that was designed as a future office and there's a second covered patio off finished walk-out lower level. The upstairs hallway features additional bookshelves and a study center that leads to an incredible master suite and three additional bedrooms and baths. Downstairs is 1000 square feet of finished space including custom built-ins and a 5th full bath. The flexible floor plan was designed to allow either the main living room or lower level to be utilized as a mother-in-law suite in the future. This home is truly spectacular! Old World Charm in a Newer Home! Kirkwood, St. Louis County - Old world charm and wrap-around-porches exude the charm of Kirkwood period homes but here they disguise the fact that this home is only four years old! The owner/builder designed and built this home to stay so it's packed with upgrades typically only found in custom homes. In addition this home is just blocks from the heart of downtown Kirkwood as well as the Kirkwood pool and park! You'll truly love the completely open main level with ten foot ceilings, massive eight foot doors, transom windows and period millwork throughout. Light shines through from three sides and floods the open living area with tons of natural light. Elegant porches wrap the entire home (over 600 sq. ft) so the outdoors become a part of your living space and makes this home a true entertainers delight! You'll love the open kitchen with it's granite topped oversized island that is obviously the center of activity in the home. There are tons of cabinets and counter space as well as an oversized pantry, and a mudroom leading to the rear porch. There's also a private desk/office area for household management. 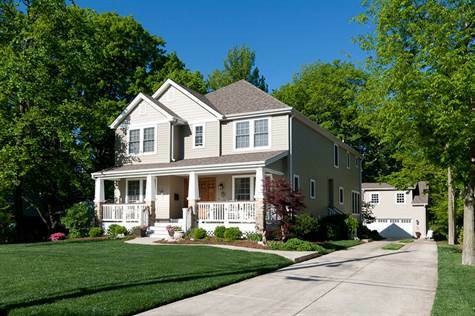 Upstairs is a wonderful master suite with a huge walk-in closet and private master bath. The bath includes double sinks, a separate shower and jacuzzi tub. And for convenience there is a 2nd floor laundry room! Two additional bedrooms and a bath complete the 2nd floor. A fully finished lower level is perfect for the in-laws or teens and includes a huge rec room, large bath and private bedroom. There is also a built-in surround system creating a home-theater environment. Outside the garage has tons of room for storage and work space and includes a heater to take the edge off in the winter. There is plenty of additional parking and a private gate that you open with your garage door openers. This gated back yard means the kids and pets can romp till their hearts content without worry! (In-ground sprinkler system available). 12733 Big Bend - We invite everyone to visit our open house Sunday, April 3 from 1:00 PM to 3:00 PM.